Manufacturers Make Sure the After-sales Service! The Composition of This Tree Model. 1pcs Main Tree Trunk and Base. 10pcs Branches and Each Branch has 4pcs Sub-branches. 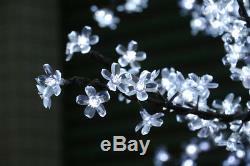 Accessory Package: 1pcs Wrench for LED Tree Installation, 1pcs Insulation Tape, 1pcs User Manual and Some Additional Large Cherry Blossom Flowers with Clear Color. Direct alternative to the ordinary energy-saving lamps, does not require any conversion. No UV and IR radiation; does not contain lead, mercury and other pollution elements. Suitable for indoor or outdoor use for Decoration. Plug: 3-prong American Standard, European Standard or 3-prong Australian Standard. SERVICE TRANSIT TIME is provided by the carrier and excludes weekends and holidays. Transit times may vary, particularly during the holiday season. 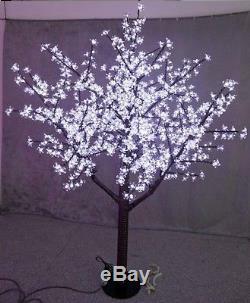 The item "480 LEDs 5FT White Cherry Blossom Tree Light Xmas Party Wedding Outdoor Decor" is in sale since Friday, September 08, 2017. This item is in the category "Home & Garden\Holiday & Seasonal Décor\Christmas & Winter\Artificial Christmas Trees". 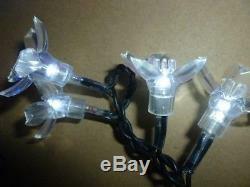 The seller is "2ledamusementlighting" and is located in Baoding, . This item can be shipped to United States, Canada, United Kingdom, Germany, France, Australia.